i had a busy day today! luckily, it involved shopping so it was fun busy. i have to go to where i grew up tomorrow... that makes two road trips in a week! goodness. 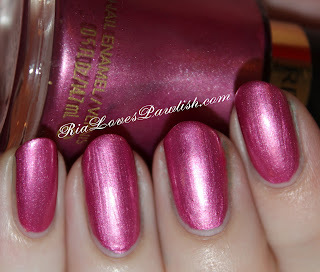 Revlon Extravagant is the polish we're taking a look at today... it's a pretty pink frost with purple undertones. the formula was lovely, two easy coats... and after the dry down, the brushstrokes aren't very noticeable (you can seem them a lot more in the photo than in real life)! it did dry dull and a coat of Seche Vite didn't give it a glossy shine like it does most things. however, the effect of this polish super chic! one coat Seche Clear, two coats Extravagant, one coat Seche Vite.